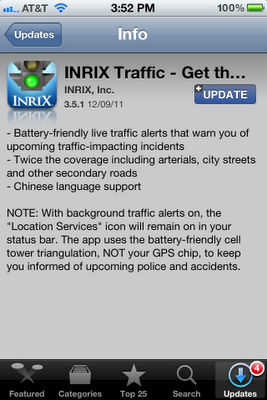 INRIX, Inc. has pushed a new update to their INRIX Traffic app today. The latest update, 3.5.1 doubles the traffic data coverage. Another interesting feature of this update is the battery-friendly live traffic alerts that will warn the user of incidents affecting traffic flow. The traffic alerts happen in the background and uses "battery-friendly cell tower triangulation" and not the GPS chip. The location services icon stays on in the status bar while the app runs in the background. The update was pushed today so I haven't tested battery usage with this new feature. 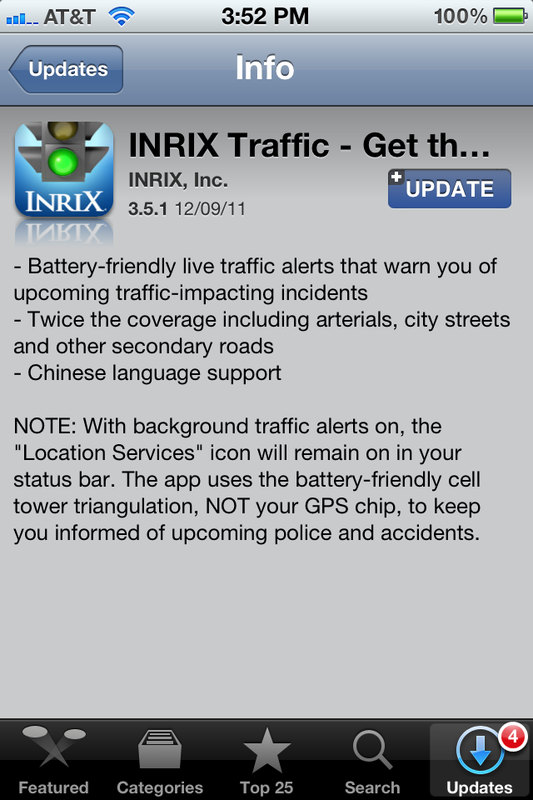 I use INRIX Traffic regularly with my AppRadio so I will have more to report in the coming days. I have used this update today and haven't had any issues so far. It's hard to see how battery-usage won't be affected much with this but we'll see. However, with the AppRadio, the iPhone receives power all the time so battery issues won't be noticeable. I can use twice the coverage though. You can get the update by clicking here. Happy updating!